When it comes to jewelry, I am a gold girl through and through. Metallic accessories however, are an entirely different story. I just can’t get enough of silver lately: I love how fresh it looks when paired with white, and the way it provides a statement in the chicest of ways. I recently acquired my first piece (see here), and the J.Crew pumps above (I already own and love their cobalt suede counterparts) are definitely next on the list. 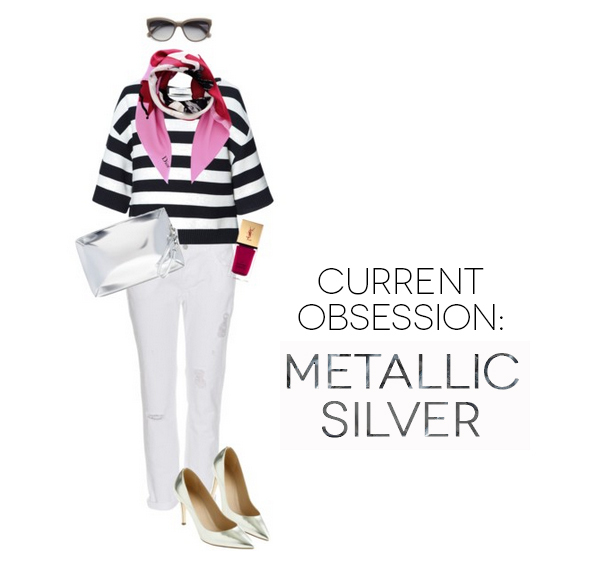 Are you a fan of metallic silver? I’m loving the comeback of metallic silver this season! I love the J Crew silver pumps! That clutch is the perfect way to incorporate metallics. I’m actually super into gold right now, but silver’s still one of my favorites! i love this! i tend to shy away from silver, but this looks so chic. may need to try this trend out! You can rarely go wrong w/metallic silver. Like you, I’m a gold girl through & through, but there is definitely a part of me lately that’s wanting to explore silver. I realized recently that my issue with silver jewelry is that it usually feels too pretty & dainty. I recently got a very rugged silver watch and I LOVE it, so it definitely has me wanting to expand on my silver! Jewelry aside, I’ve definitely had my eye on silver metallic pumps – there’s a cute t-strap pair at Zara right now! I really love the J.Crew ones you posted above, too! So cute! I can definitely see this on you Jen! I’m a gold-lover as well, but silver metallic is growing on me! It’s super trendy and fresh looking.